Be afraid, be very afraid in Star Wars Battlefront 2 as the Ewoks are coming. 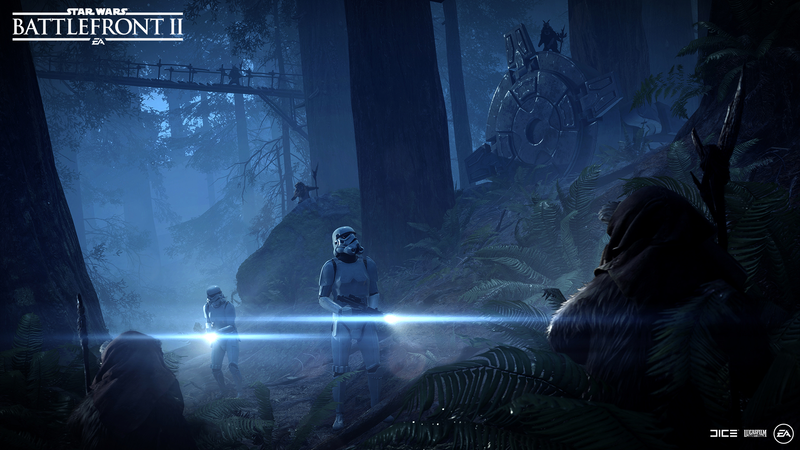 Starting on April 19, players can play a limited-run Ewok Hunt mode as part of the Night on Endor update. It's the kind of mode that sounds absolutely ridiculous that I can't wait to see it in action. Ewok Hunt mode works like your standard Infection mode, but with Ewoks and Stormtroopers in place of zombies and soldiers. Players will either spawn as an Ewok or a Stormtrooper. Ewoks will then ambush Stormtroopers using spears, Wisties, and Ewok skills. Each Stormtrooper taken down by an Ewok will respawn as an Ewok, a process which continues until every Stormtrooper is taken care of. However, Stormtroopers are much better armed than Ewoks and can probably take on a couple through raw firepower. So it's up to Ewoks to work together to take down all the Stormtroopers before their evacuation arrives and takes them away from Endor. The Night on Endor update will deliver Endor Leia, Endor Han, and over 50 additional Appearances to customize their characters with the update. To be clear, appearances are cosmetics that don't affect a player's in-game performance. Skins were a heavily requested feature from the Battlefront community, so it's cool to finally see them available. To purchase Appearances, Crystals will return along with the update and can be purchased with real-world money to exchange for Appearances. As you might recall EA announced that loot boxes will be completely removed from Battlefront 2. Only cosmetic items like Appearances can be purchased with real-world money, starting with this update. Players will be able to earn Crystals in-game as well in case they don't want to pay for skins. It took awhile to see some of these features return to Battlefront 2. After the controversy with loot boxes being pay-to-win, EA promised to return to the drawing board and figure out a better way to monetize the game. The solution was to completely remove paid loot boxes and Star Cards, opting for a more streamlined leveling and unlock system. For more on Battlefront 2, check out our complete Star Wars Battlefront 2 guide for all the latest tips and info. With the loot economy changes we will see if players return to Battlefront 2, which we praised for its exciting single-player story mode but critical of the original loot system. Tagged with dice,	Electronic Arts,	Motive Studios,	News,	PC,	PlayStation 4,	Star Wars,	Xbox One.